Dasha Lezhneva sat opposite me on couch, hundreds of kilometers away from her home town in Ukraine as she spoke candidly about the political climate she grew up in and how it fostered negativity throughout her and her peers. Dasha moved to Denmark nearly four years ago to attend university, where she now studies economics full time. She wanted somewhere she could get a fair education and a degree which she could use to go back and help Ukraine and its people. Young people are leaving Ukraine for either higher education or in a bid to find higher paying work and better working conditions. The Ukrainian government creates a hostile society with corruption that directly impacts both working and educational environments for young people. For example, it is possible to “buy” your way through your degree which results in people in high positions they have no skills for. 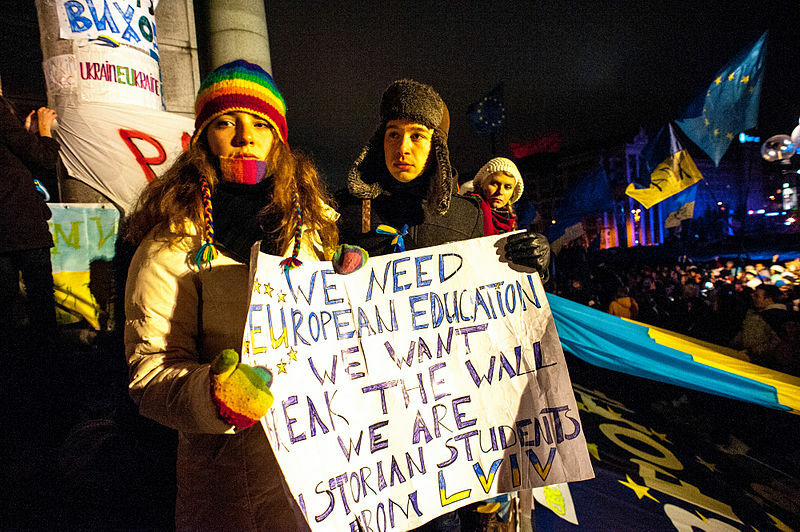 Higher education is one of the largest institutions where corruption is most common in Ukraine. According to the International Renaissance Foundation, 33 percent of all students claimed they have encountered corruption in their school, and 29 percent heard about cases of corruption from other students. Meanwhile, Transparency International found 47.3 percent of university students stating that a bribe had been demanded from them; of those, 29 percent had paid this bribe freely. This has created a lack of hope, potential and inspiration among young people like Dasha. This system has the potential to create a cycle of brain drain which will further deplete the Ukrainian economy. “I mean, of course, in every institution and in every situation, there are people who are honest and strong willed and believe we can still make it being honest but what they end up with after being honest is absolutely nothing,” says Dasha. In an attempt to fix the rampant corruption, the Ukrainian government and Economic Ministry have made several promises in recent years to make Ukraine a more attractive place to live. Minimising corruption has in recent years been the main focus for the ministry. There has been several reforms and within these reforms the government is attempting to implement the key principles of “transparency, efficiency and public disclosure” in an attempt to limit any and all possible corruption. There have been notable successes by the Ukrainian government in combating corruption since the Euromaidan Protests in 2014, during these protests millions of Ukrainians headed to the capital to protest the government’s decision to suspend the process of Ukraine entering the European Union. The protests were fuelled by widespread government corruption, abuse of power and violations of human rights in Ukraine. Since then, there has been several smaller protests for the same cause, with two of them occurring in the last month and a half alone, all of which were primarily lead by students. Pressure on the government from civil society groups, international organisations, the European Union and the International Monetary Fund has been constant. These groups encouraged wide ranging judicial reforms in 2016, including moves that put in place a “comprehensive anticorruption framework modeled on European Union practices.” This project works to give more power to local governments and encourage more dialogue between citizens and government entities. Transparency International and the National Anti-Corruption Bureau of Ukraine have both been working on minimizing corruption in Ukraine. But, Ukraine still sits as the most corrupt country in Europe, and in 2017, according to Transparency International, Ukraine received 30 out of 100 points in the corruption index. This number is higher than in previous years but is still below the European average. With the combined effort of institutions, Ukrainians and the government change are slowly occurring throughout the country. According to graphs based on the global corruption index made by TradingEconomics, there is indication that in coming years corruption is likely to go down. The higher the number on the graph, the less the country is considered corrupt on the global corruption index. As of December 2017, Ukraine currently sits at 130 out of 180 countries. While this is the case, many Ukrainians believe that there is not enough being done and for real change to happen in the country something drastic needs to occur. “I think there needs to be some kind of superman coming to change things or otherwise nothing will change. I always want to have hope but it’s hard,” says Dasha.